Those who have joined the ride of supporting a football team for life would know that one has to leave their dignity and control of happiness at the door for they won't be needing them where they are going. The Manchester United, Chelsea, Liverpool, and Arsenal fans in India would probably agree to it – after all, supporting a team irrationally without any parental ties or national obligation has to be special. However, when they were asked to show the same unreasonableness after being given a club of their own, they have faltered. The emergence of the Indian Super League led to many fan groups mushrooming in different parts of the country and one of the more vibrant ones was Kerala Blasters’ Manjappada. Flooding Kochi’s Jawaharlal Nehru Stadium in thousands wearing the yellow jersey, they were even likened to Borussia Dortmund’s yellow wall. Riding on the vehement support, the Blasters also did reasonably well in the last four years of the tournament but a title still evades them until today despite making it to the final twice. After dismissing René Meulensteen midway last season, David James was handed the reins when they finished midtable. Hence, this season was always going to be a test by fire for the former English custodian where he had to rise up to Manjapadda’s massive expectations. Kerala Blasters have won just once this season, so far, in their opening game against ATK, drawing six times and losing five of the twelve games that they have played. The fan group consequently called for a clarion boycott after their ninth match ended in a stalemate and the stadium, which would otherwise see 20, 000 to 30, 000 on a match day, saw some 8500 people turning up in their clash against Jamshedpur FC. The protest rocked the club as the Jawaharlal Nehru Kochi stadium on December 4, looked like a graveyard of hopeless souls more than anything. The banners ‘Supporters, Not Customers’, and ‘We Deserve Better’ hanging from the stands added insult to the wound and so much so that even German football legend Lothar Matthaus, who was present in the match as a part of the Bundesliga Legends Tour, urged the fans not to boycott games. “It isn’t a protest against the club, but against the worst case happening. In last seasons, even though performance was poor we stood up with the team. They have the same strategies being used repeatedly. Even kids can predict our useless highball movements now. ‘#passtheballtochestandforwardtakeitfromther’,” said a Blasters fan, when asked his views on the matter. Ask the most successful managers of the world and one will know that differences between fans, the managers, and the management policies, are practically the pillars of a successfully running club. The issue with these things generally is that both the manager and the management had their own reasons to wait. James, who had got in players keeping a particular setup in mind, was skeptical about experimenting drastically as it might have even stopped their occasional refuge in draws, and neither could a change in management guarantee success as European clubs provide enough evidence every now and then. Fans haven’t been entirely idealists with their demands as well, for, while winning have always proven to be the best way to retain fans, most European clubs have retained fans without winning titles. And the Blasters don’t need to look further than the side they reflect the most – Borussia Dortmund. 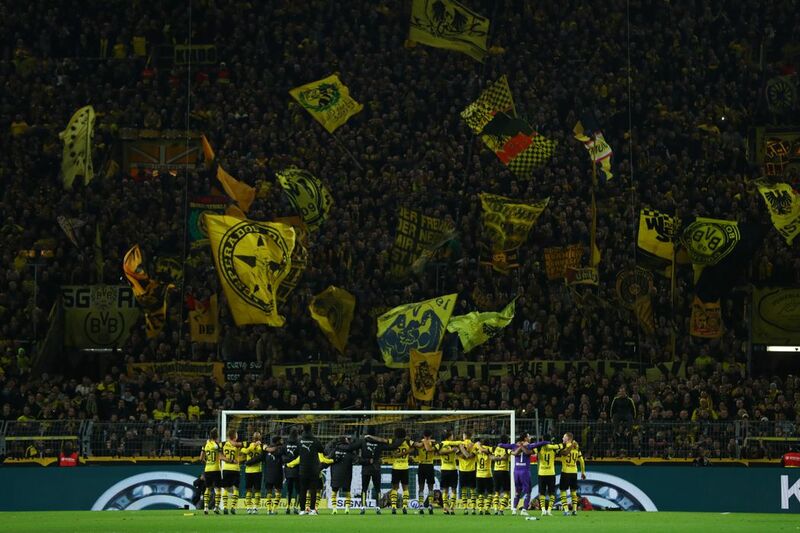 Since the golden period of the mid 1990s, when Dortmund won two- back-to-back titles, the club has hardly seen success. Amidst the pathetic financial management, basing transfers around old friendships instead of expertise, the increasing debt, and the collapse of the TV market, the club has never been the same. Though becoming the first German club to go public on the stock market helped them temporarily, a crisis was inevitable and it punched hard. The fans had every reason to criticize the management and they did. The BVB Ultras organized protest marches in 2005, first at the away match in Hannover and then before the home match against VfL Bochum the following week, which pushed the club into action and consequently, a change in hierarchy. Emptying the stadiums while their players played was never a thought that crossed their mind. The concept is difficult to grasp here because the Indian Super League has thrived primarily on the ardent lovers of European football in India, who flocked into the stadiums as money brought in European stalwarts of yesteryears. But, while the glitz and the glamour could be imitated to a large extent, what couldn’t be replicated was the ‘fan culture’. For millions of Britons, for example, playing football and supporting a club passionately had been more of a medium where boys grew to adults earning the respect of their dads and grudging older brothers. Indians didn’t have that identity of growth. The incredible fandom in European football clubs, which has now spread to other parts of the world, has multiple layers of history and emotions attached to it. While the sport was always a source of entertainment, it grew into an escape from the mass depression endured by many European countries after the Second World War. There was no stopping it after that. Humans have been always tribal by nature, identifying themselves with groups that have struggled against other groups at all times. Hence, the rise of derbies came into the fore and more rapidly emerged the organized hooliganism, which started in 1960s and over the next few decades made football a channel for violence. To further compound this, the European football history experienced tragedies like the 1958 Munich Air Disaster, the 1989 Hillsborough Stadium Disaster, the 1985 Heysel Stadium Disaster, and others, which hugely contributed into taking the love for the game beyond rationale. Now, such tragedies are never desirable even if the consequences it bore were of phantasmagorical proportions, but one cannot deny that India’s fandom towards football has lacked such misadventures. It is not entirely true though, for the 1980 Kolkata Derby Stampede, which had killed 16 people at Eden Gardens in Kolkata during a match between East Bengal and Mohun Bagan, is till date the greatest football tragedy in India. But then again, none of the two clubs have ever complained about fans not turning up on matchdays, regardless of their form. However, while the lack of tumultuous emotional rollercoaster that today’s fans haven’t undergone would be a disadvantage for ISL, their viewers not being very different from the modern football fan in terms of their overt investment in social media is certainly a huge advantage – something that neither the league and nor most ISL clubs have exploited. The biggest mistake that most ISL franchises are committing have been banking on the sheer love of the game to sustain it, when the football audience has gone way farther than the post-match football shows. Football might be an old sport in India prevalent from the pre-independence era, but ISL’s primary viewers has been youth, who, even if aren’t identifying themselves to a club culturally and passionately, would definitely be intrigued to clubs through modern experience at stadiums like music and gaming. While it is difficult to date and find the club that had first used pop culture to keep its crowd invested, it was Liverpool who became famous for playing the chart top 10 as pre-match build-up. Their terrace used to make the most noise and games started having a soundtrack of their own. Newcastle United fans sing ‘Blaydon Races’, while West Ham United fans hum ‘I’m Forever Blowing Bubbles’ even to this day. Not only was it a method of keeping the crowd invested but also building a club’s legacy in a way. “You’ll never walk alone” is today universally acknowledged by each and every Liverpool fan anywhere in the world. Despite pop culture having such an immense impact over fans in Europe, it is surprising how ISL still hasn’t resorted to it. A matchday should be way more than just the match for the fans; it should be a feast that one would be eagerly waiting for. Another huge blow to the bridge between the club and its fans would be the lack of two-way communication, in which fans get to share more of the blame. In today’s world, where anything and everything could get viral in the blink of an eye, opinions are the easiest to pass on - something Arsenal Fan TV has successfully done. While one would argue that 13 losses in a season and finishing sixth were the main reasons why the legendary Arsene Wenger was sacked, one couldn’t deny that the fan channel played a vital role in making their displeasures known week in week out and also turning up at Emirates at the same time. If one Facebook post by Manjappada could slash Kochi’s crowd by half, one can only imagine what a vocal platform could do. With Indian crowd fast taking into platforms like Snapchat, Whatsapp, Instagram, and Spotify, the clubs could attain immediacy to those fans who cannot visit the stadium. Now, the onus also falls on the fans to keep the support burning no matter what. While European and South American football is filled with a plethora of such examples, a better example closer to home would be the West Block Blues. After the likes of KGF Academy, HAL and South United FC - all of which failed to draw any crowd whatsoever, the introduction of BFC was received with skepticism. And whether it’s the club’s continuous winning form or the atmosphere inside the Fortress, but BFC have only gone on to garner more support. While the club has tried its best in keeping the fans happy even if that meant as little as a gesture of allowing a young fan to cut his birthday cake inside the dressing room while the whole stand sang ‘Happy Birthday’, the West Block Blues have reinvented fandom in more ways than one.